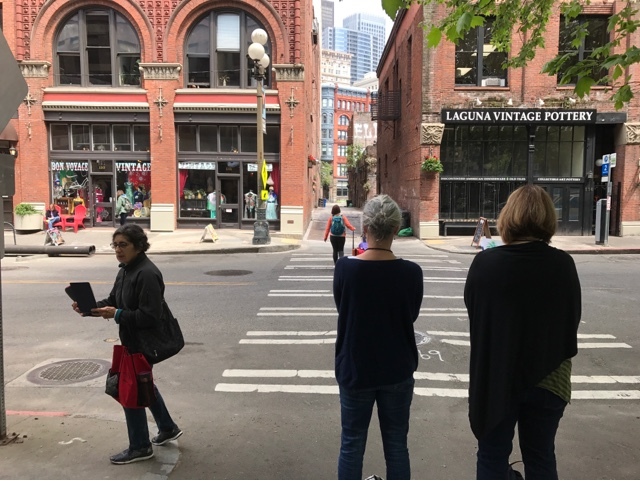 Urban Sketchers Seattle: First Steps into Visual Journaling Workshop is a Wrap! First Steps into Visual Journaling Workshop is a Wrap! 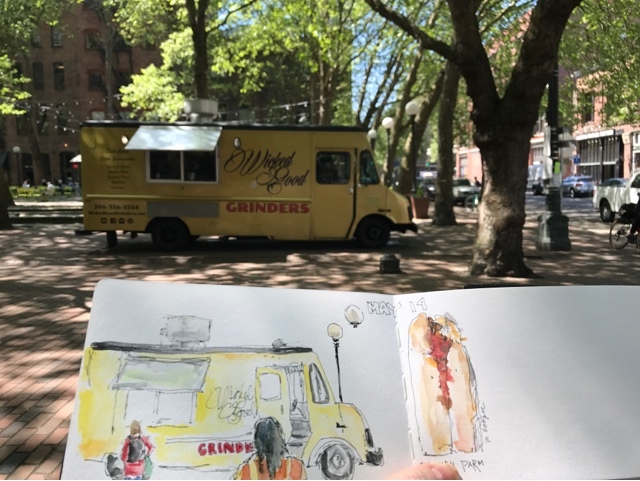 I went to Occidental Park on Monday before the workshop to see if anything had changed since the last time I was there and to do a few warm up sketches. Oh, and to check out the food trucks. My warm up sketches in progress on Monday. Sorry, no food trucks on Saturday. 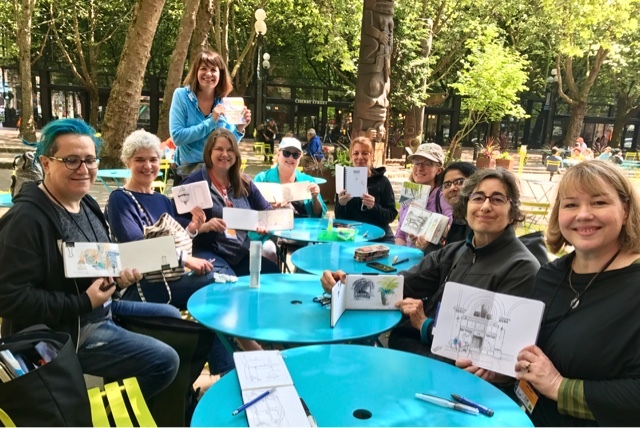 Saturday, May 19, I met with my students in Occidental Square for Seattle's USK Workshop #8 of the 10x10 Spring 2018 program being held around the world this year. 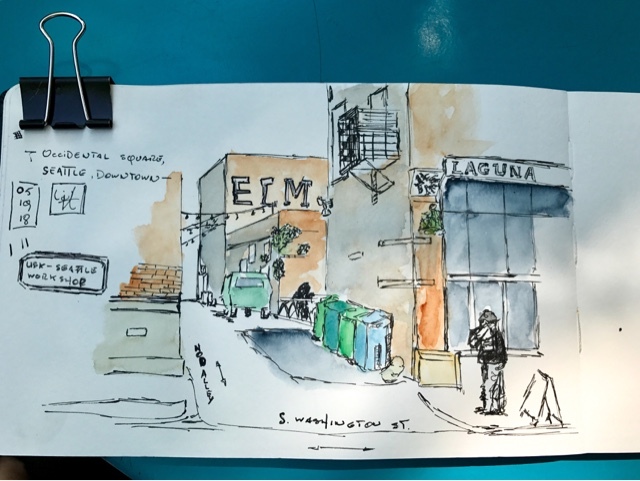 Ten, or so, instructors in each area are teaching various aspects of urban sketching in the cities where they live. 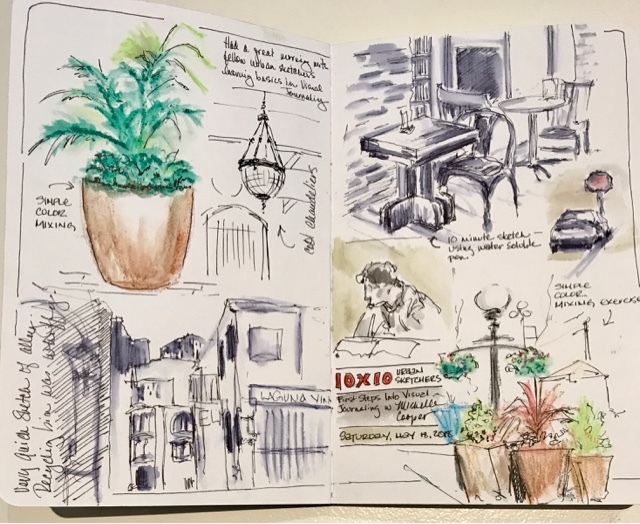 Geared toward beginners, my workshop "First Steps into Visual Journaling" gives some easy, basic touchstones of urban sketching to those who are new or those who just haven't picked up a sketchbook in a while. 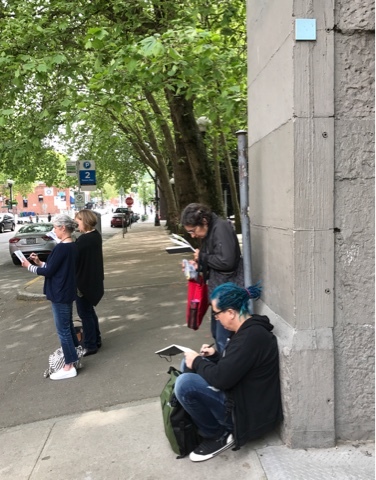 I couldn't have asked for anything more: Here I am on a beautiful Seattle Saturday with my enthusiastic students, ready to take their first steps into urban sketching. 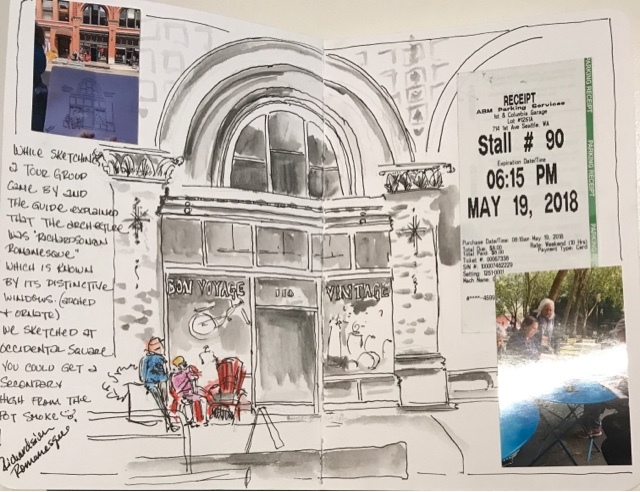 See Jane Wingfield's review here on Seattle Urban Sketchers blog. 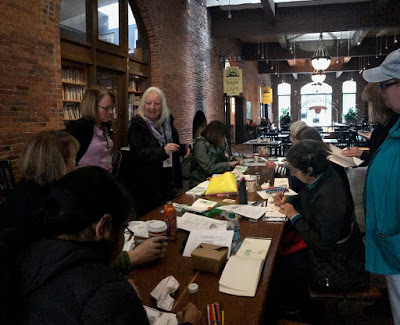 We had a fantastic venue, rain or shine, with pretty much the entire indoor arcade and huge wood tables to ourselves for the first part of the workshop. 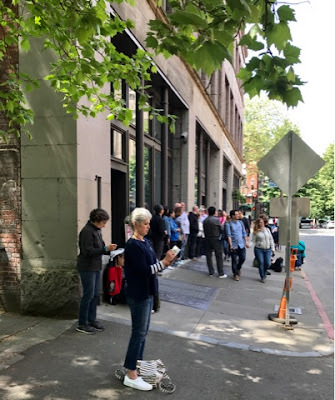 Due to the 9:00am start time, we even had the bakery and coffee shop easily accessible without the usual long lines typical of the late morning and lunch crowd. Many used the Grand Central Bakery cards as part of the collectible ephemera incorporated into their visual journals. 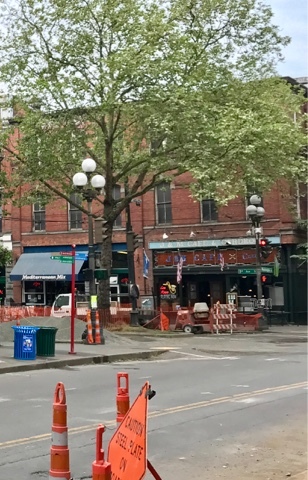 There's always something interesting going on in Occidental Park. There is a plethora of "street furniture" in the neighborhood to sketch. Standing, sitting or on the run, sketchers are busy capturing their day in their visual journals. The street gets busier as the morning progresses. The students progress as they get busier! We even shared the sidewalk for a while with a large tour group. A savvy urban sketcher in "secure" sketch mode while a tour group stops by. I managed to get some photos of my students at work on their assignments. Following are a few of the visual journal pages from the workshop generously shared by some of my students. Aren't these new sketchers (and a few more experienced ones) fantastic! PS. 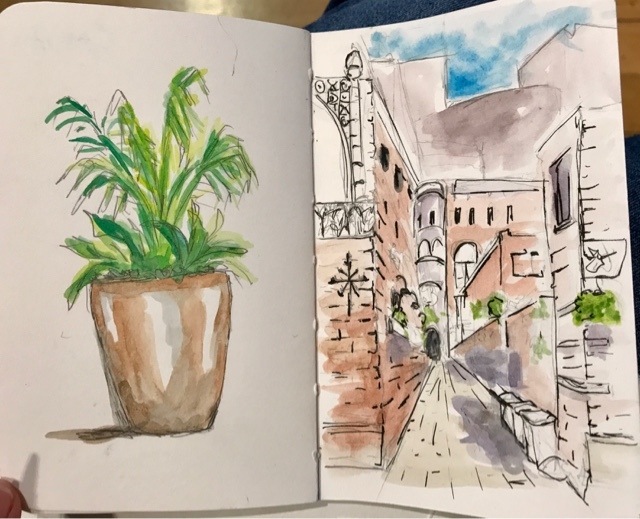 I wanted to give priority to my students in this post but I am working on an article with my sketches and some images of my illustrated pages from the workshop. I will post that one soon. 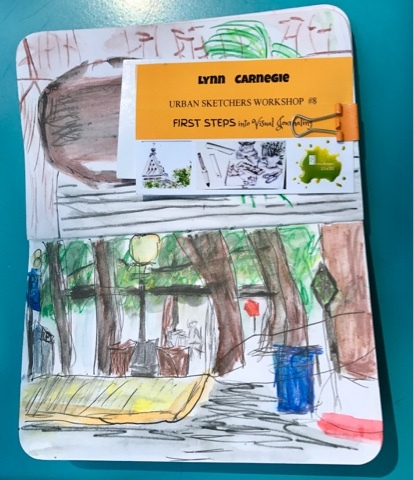 Even practiced sketchers are welcome at the "First Steps" workshop. Nice work! The shadows of our tree-lined park with all the identifiable elements of this particular urban scene. Choose simple subjects when trying out new materials. This student combined all her 10x10 classes so far on the right hand page. 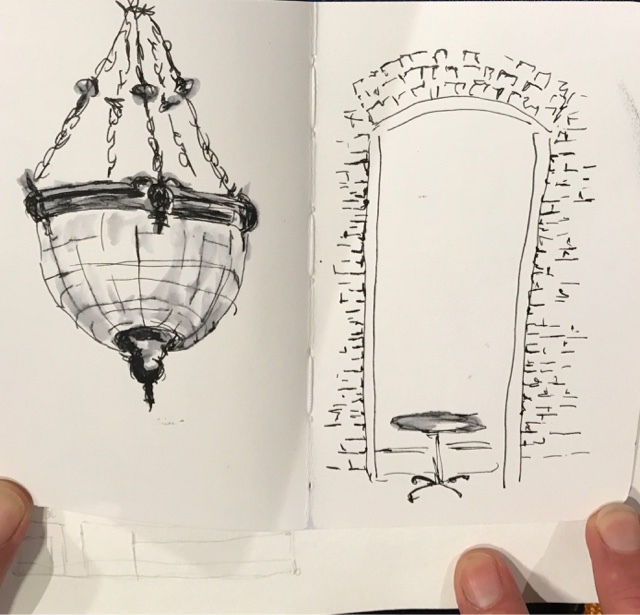 Plaques, signs and conversations overheard while sketching can be used to inform the narrative of a visual journal. This page has a couple of mini photos taken on the spot and info overheard from a tour group that paused nearby. This spread is well composed with all the elements of a visual journal. 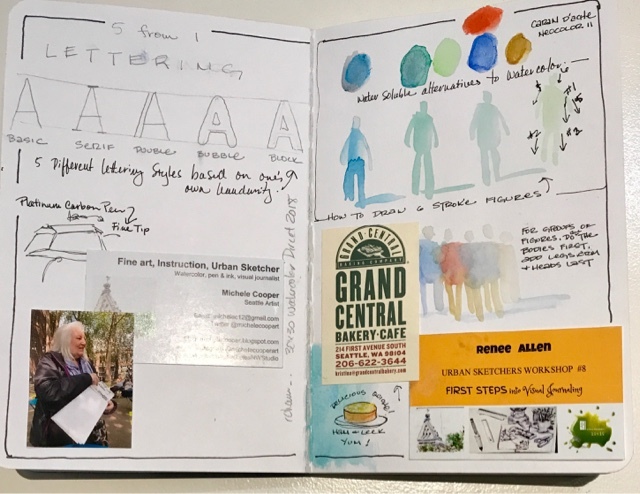 Each individual makes this a visual journal that is uniquely their own, a record of their personal experience and reportage of their on location observations. Line, shape, form and texture all expressed simply and beautifully with a water soluble ink pen and waterbrush. This spread aptly documents the experience of being in Seattle's first neighborhood on a beautiful May morning. Thanks for coming, everyone! Thanks for giving me permission to post your journals. I had a blast teaching, sketching, and sharing the day with you! Thanks to Jane Wingfield for covering the workshop in your superb article and review. Read it here. You guys do a wonderful job of sharing and I enjoy your posts so much! Thank you! Thank you for following our blog. Glad you enjoy it!